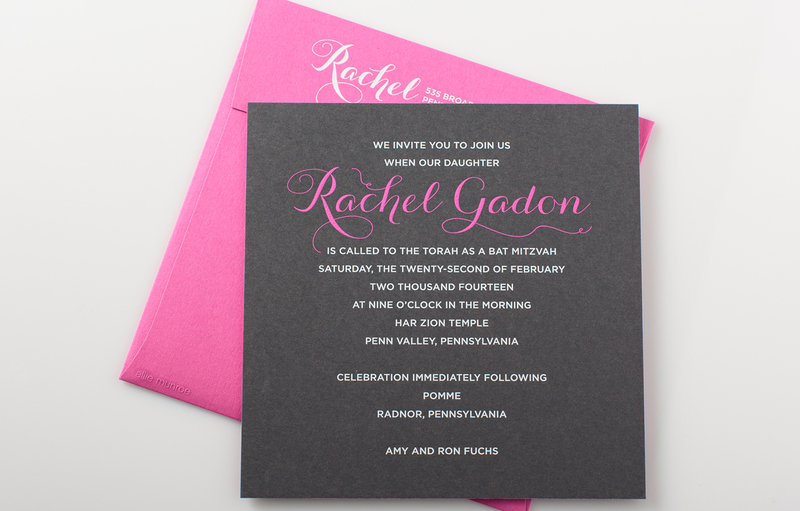 We’re feeling in the pink from working on this Bat Mitzvah invitation, ordered through The Party Package in Bryn Mawr, Pennsylvania. For this set, the phrase “The beauty is the details” says it all. We mounted an engraved, dark grey invitation on the front of a thick board, backed it in dark grey paper and then edged it in hot pink ink to match the name. The set was completed with a hot pink heavy weight envelope lined in matching grey paper. The combination of dark grey paper, white clean type and a hot pink script name created a mix of modern elegance and youthful femininity. It was such a pleasure working on this beauty, until next time!